The theme for Black History Month 2019 is Black Migrations. Special emphasis is placed on the timeframe beginning in the early 1900s until the modern era within the United States. In particular, social and cultural changes within Black communities are examined, as well as push and pull factors facilitating migrations within a larger geopolitical context. Click here to learn more about this year's Black History Month theme. 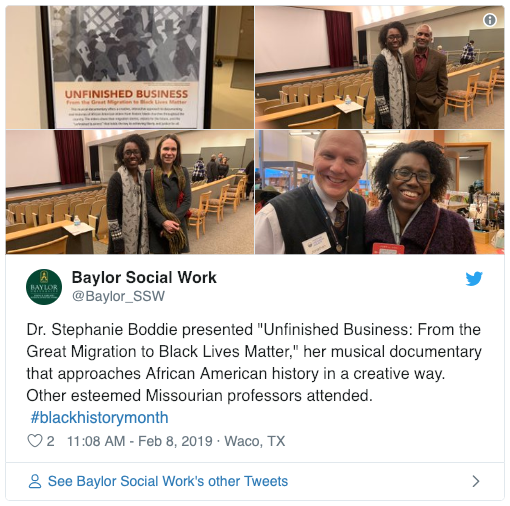 Dr. Stephanie Boddie will present her work "Unfinished Business: From the Great Migration to Black Lives Matter" at the Missouri History Museum to commemorate Black History Month. For more information about Dr. Boddie's presentation, as well as additional events, click here. Check out Isabel Wilkerson's powerful Ted Talk, where she shares a moving testament to the lasting impact one decision had upon millions of individuals, families--even an entire nation. For more information about the Great Migration, click here. You may also find more information about the Great Migration at this location. 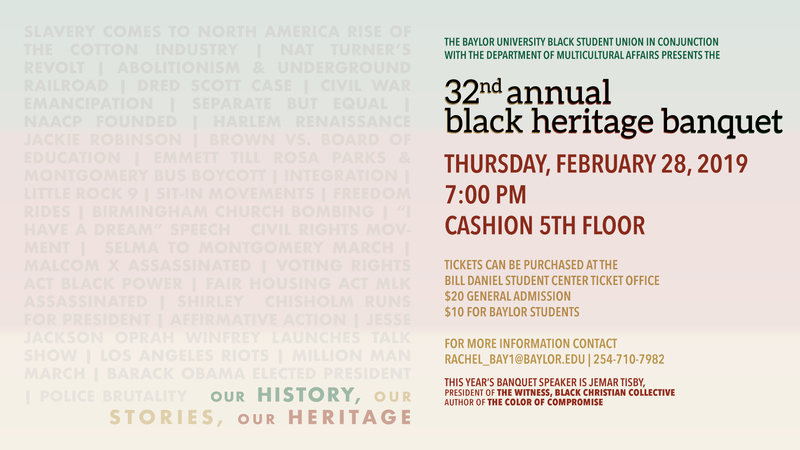 Baylor's Department of Multicultural Affairs has a host of events lined up during the entire month of February to both honor and celebrate Black History Month. Take a look at the schedule by clicking here, or look at a small sampling of upcoming events below. Like an un-killable cockroach, racism keeps scurrying back into our lives to creep us out and contaminate everything it touches. No matter how many laws we pass, resolutions we write, or programs we implement, racism still seems just as present today as it has been in centuries past. Why is this? Why can’t we make more progress faster in combating racism? The problem is we keep fighting systems of oppression but we do little to disrupt the narrative of racial superiority and inferiority. This session will help us understand how America created the story of anti-black racism and spend some time explaining ways to flip the script in order to pursue meaningful racial justice right now. Jemar (B.A. Notre Dame; MDiv RTS Jackson) is the president of The Witness: A Black Christian Collective where he writes about race, religion, and culture. He is also the co-host of “Pass The Mic”, a podcast that amplifies dynamic voices for a diverse church. His writing has been featured in the Washington Post, CNN, Vox, The Atlantic, and the New York Times. He has spoken nation-wide at conferences on racial reconciliation, U.S. history, and the church. 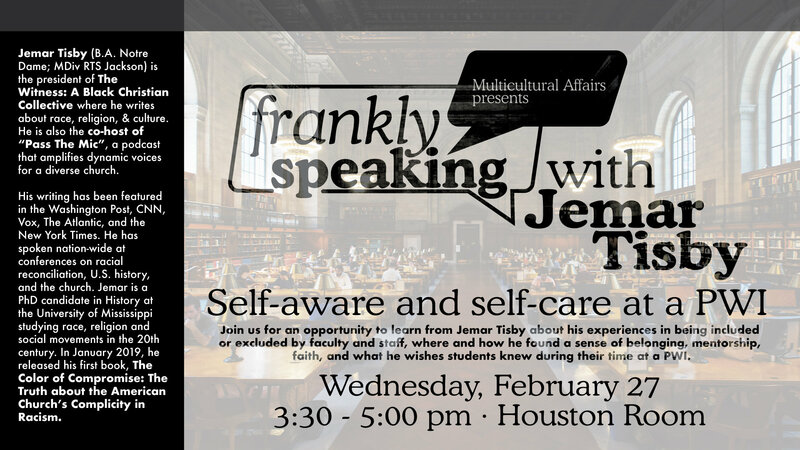 Jemar is a PhD candidate in History at the University of Mississippi studying race, religion and social movements in the 20th century. In January 2019, he will release his first book, The Color of Compromise: The Truth about the American Church’s Complicity in Racism. Follow him on Twitter @JemarTisby. 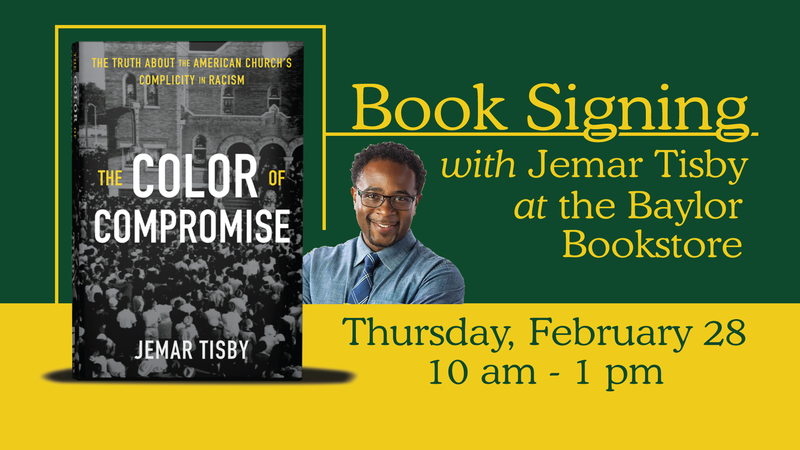 Check out Jemar Tisby's lecture, "How to Fight Racism," which he presented at Baylor University on January 17.